Describe someone's living space in no more than 500 words so that we can vividly imagine the absent person. Then guess from the descriptions posted the type of who lives in a room like this? It could be a policeman, assylum seeker, a housewife, an author, a foster child, a Vicar who likes DIY, anyone you like, really but not a famous person. i.e. 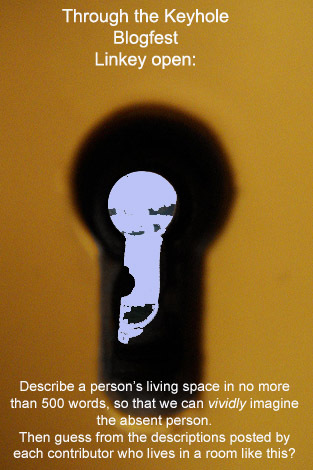 Write a description of a room and then others may respond by describing the TYPE of person who might live there. * LINKEY will remain open until next Saturday 11th December. POST YOUR ENTRIES BETWEEN NOW AND THEN. I didn't participate in this blogfest, but my guess is C. S. Lewis. Trains and fantasy. He is one of my favorites. Thank you for dropping by my blog today. Madeleine do you see the genius in your work? are you able to see how good a writer you are? I really enjoyed your piece! I loved how the fly touched on so many little but telling things throughout the room. Wonderful. Hi NRWilliams. Well not specifically C S Lewis, but someone with similar tastes. Thanks Jo, I just need to fit all the elements together to create a publishable story LOL! This would be SO SOOO good for me. BUT I'm editing in too many places to write something new. I'm sure I'll pop around and check out the entries. I always learn a lot from other people's writing. Hi Madeleine! Sorry, I'm a little confused. Are we meant to describe how we imagine a famous person would live, or are we meant to be writing a description of a room and then people respond by describing the TYPE of person who might live there? And when does the blogfest end? I really liked the idea that you used a fly to help the reader explore the room. That was a brilliant choice of detail. I would really like to know more about this writing exercise. Is it weekly? When do the prompts go up, when do the posts go up? May I join? I'm still in Florida and getting ready to leave on Saturday. Not the best time for be to do an entry, but I wish I could. Charming story. Your descriptions are flawless. Loved the details. I agree with Joanna! Genius. Okay, I just signed up for the blogfest! It sounds like fun, and I've got an idea of who I'm going to write it about . . . do I post this weekend once the linky closes? I'm in! 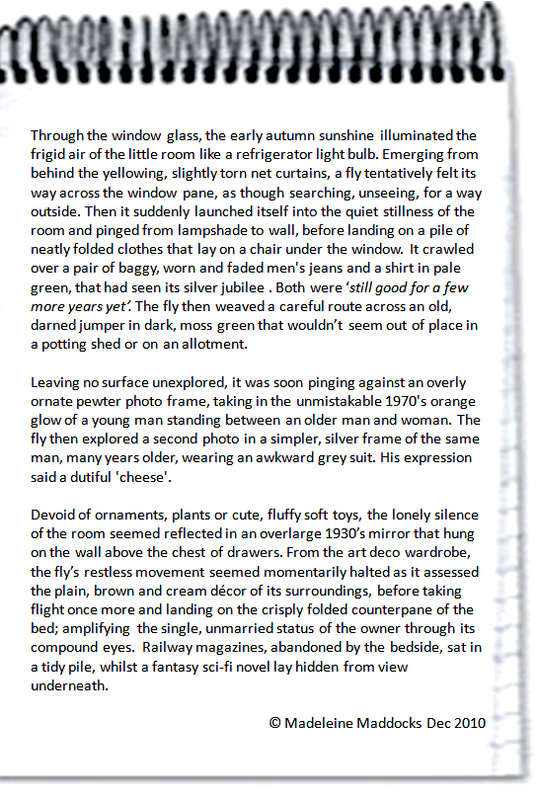 It's rushed here, but I think I can write up the description! When is the blogfest date? Saturday? Please let us know so I can post it that day! I love yours, I feel I've seen this guy in Bideford! Yup I'm on board...I'll post next saturday. I've decided to sign up. As for yours, I'm getting the sense of a male character, probably just hitting middle age, and probably not having achieved quite as much as he wanted to. It sounds like the fly has found a fountain of fun. A bachelor's pad. Someone old who has a love for old things. Great piece! Thanks for hosting this blogfest. It's been a LONG time since I've participated in one, too! I'm loving the entries I've read. Thanks to everyone who has entered so far. Glad you're all having fun. Thanks for doing this blogfest - it's great.